Difficulty passing urine, stones present in urine, blood in urine, urinary tract infection, lower abdominal pain. The Chinese term “LIN” is generally referred to frequent and urgent need to pass water, or obstacle, pain and dripping in making water. There are stones, blood in urine and Old-Age LIN, including such diseases in urinary organs, stones, tuberculosis, chyluria and prostatitis. In the ancient Chinese medical book “Dan Xi Xin Fa”, it says: “LIN” is caused by virtual weakness of kidney and heat in the bladder, the inharmonious “masculine” and “feminine”, and the urgency to urinate in bladder. As a result, blood and stones are carried with urine. This dripping is accompanied with pain. Stones, or sandy-like urine, is mainly caused by concentration of “wet and hot” in the body cavity below the umbilicus housing the bladder, kidney and bowels. Heating the body fluid and causing foreign substances in the urine to become sandy-like stones. Blood in urine is mainly caused by internal heat in the small intestine. In other words, heat concentrates in body cavity below the umbilicus, causing either blood to circulate in a wrong direction or lungs and kidneys to be weak and feeble. As a result, branches of channels are hurt and blood is seen in urine. 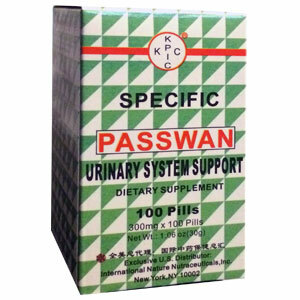 Passwan is specially and scientifically prepared with the essence of the traditional Chinese medicine. Its clinical use proves its excellent effect without any side-effect and is thus generally applied for the treatment of different kinds of “LIN”. Dispel stones, disinhibit fluids, clear heat. Diuretic, antipyretic. This formula should not be used by women who are pregnant or by women who are extremely anemic or blood deficient. Any woman with a pale face and pale tongue who is often late starting her period or has short, scanty periods with pale blood should not use this product.